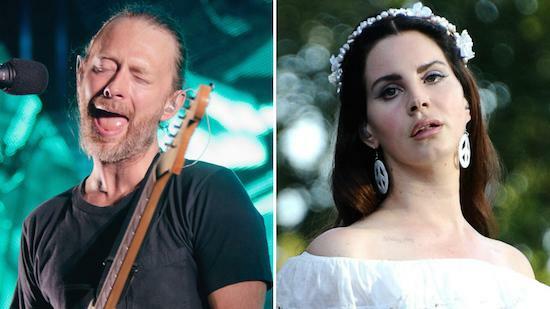 Earlier this week, Lana Del Rey posted a tweet seeming to confirm rumours that Radiohead had issued a lawsuit against her regarding similarities between her track 'Get Free' and their 'Creep'. Now the band's music publisher has issued a statement disputing the existence of a lawsuit. "As Radiohead's music publisher, it's true that we've been in discussions since August of last year with Lana Del Rey's representatives," said a representative for Warner/Chappell. "It's clear that the verses of 'Get Free' use musical elements found in the verses of 'Creep; and we've requested that this be acknowledged in favour of all writers of 'Creep'. To set the record straight, no lawsuit has been issued and Radiohead have not said they 'will only accept 100%' of the publishing of 'Get Free'." The statement follows Del Rey's claim that the band were requesting 100% of the royalties from the track. She also said during a concert last night that the lawsuit could result in the removal of the track from her 2017 album Lust For Life.